Discussion in 'Change Log' started by Drui, Apr 24, 2018. In this update we've resolved a memory leak that was causing memory consumption over long hours of uninterrupted play to climb steadily higher, eventually causing system performance deterioration. We also addressed the most common crashes over the past two weeks, and we will continue to monitor the game's stability after this update. We updated the compounding settings of the pillars, they now behave consistently and how they used to. Consuming fruit juice and tea now returns you an empty jar for re-use. When interacting with other players their names now show up in the notification, and we improved the combat hit calculations to be more accurate. For the server admins we've introduced Watchdog. Watchdog simply monitors player activity and writes it to a separate log file. It logs when players are entering other people's claimed areas, it logs when damage is dealt, and it logs diplomatic status changes. This will allow admins to track down griefers with greater accuracy. Server administrators looking for specific information can contact us with suggestions at either medieval@keenswh.com, leave a message in this topic, or write to Deepflame directly on Discord, and we will take it into consideration. Finally, for the modders there were lots of little changes, have a read over at the modding changes list to see what was changed. The most important part is that your custom models should now LOD correctly. - Fixed several memory leaks that was leaving deleted game objects in limbo. - Fixed saving the game while voxel hands are active crashing the game on load. - Fixed a crash in ranged weapon reload when stamina stat was missing. - Fixed a crash attacking blocks that were just destroyed. - Several crash fixes to various physics related systems. - Introducing Watchdog, it tracks server activity. - Localized item tags that were missing localization. - Tweaked female run animations to be a little more fluid. - Removed torches from barbarians, they were equipping them all the time. - When interacting with other characters their name is now displayed correctly. - Fruit juice and tea now return the jar used to create them when they are consumed. - Updated the hit calculations in the combat system, hitting should be more reliable now. - Updated pillar compounding, they should now behave consistently, and as they used to. - When loading a game with active equipment the toolbar now correctly shows the equipped state. - Improved server-side bandwidth usage by not sending physics information for each stationary dynamic object. - The crafting components now utilize the CraftingSpeedMultiplier, a lower value reduces the crafting time. - Allow consumables to return items upon consumption, look at Fruit Juice and Tea for examples. - We fixed ParallelTask getting set to null but not set to a proper value on reload. - Changed Hunger effect definition to allow greater flexibility in modding changes. - We updated transparent block rendering to render like it did before 0.6.3. 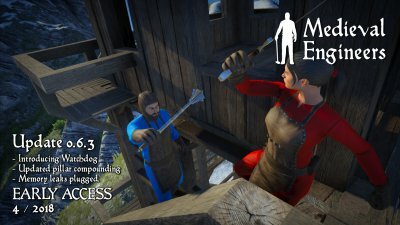 - Updated quest condition base to fix a modding problem. - The Toolbar component is now an entity component. - Model LODs for custom models now load correctly. - The StepComponent nows support appending. - Whitelisting Animation Variables storage. - Fixed a client crash when accessing lootbags on a DS with an inventory multiplier less than 1. - Fixed a crash when unloading any equipment mods while still having the modded items equipped. - Fixed a DS crash when spawning lootbags on a DS with an inventory multiplier less than 1. - Fixed a crash when trying to pick up blocks when they are unloading from the game. - Toolbars no longer disappear when alt+tabbing, or when changing game resolution. - Altered mouse DPI handling for people with extremely high DPI settings. - Tweaked options screen to prevent mouse sensitivity going to 0. "I made the goulash. The least you can do is wash the dishes after you eat it!" Hurrah! Now I can finally start making juice and tea! I was about to make my first fruit juice/tea last night, but my wife made me stop to eat dinner instead. At least I know that these drinks will return the jar as I hoped/expected. "Consuming fruit juice and tea now returns you an empty jar for re-use." Invention of recycling in the medieval world confirmed. Consuming fruit juice and tea now returns you an empty jar for re-use. Good update. Love getting back those jars after drinking the juice. Best thing here is the ability to help admins track griefers, LOVE IT! Do have to admit solving the memory leaks is impressive. As a long session player this is good to see and will help us a lot. Current hopes and dreams............ with fire damage as ya stand in a fire now a thing in game, I want tar to place on fields and flaming arrows to shoot into it to start it on fire to BURN MY EMEMIES during an attack. Can't wait for more things to use for fire traps....HA HA HA "Let em burn!" You COULD already hurl campfires and fire pots in the general direction of your enemies and hope that you hit them with the flaming side. Or place them in a trou de loup like fashion in shallow holes -- although the emitted light and smoke might give away their position. Hello. I wildly apologize for my English, because he does not know that I live in Russia, but that's not the point. I would like to thank you immediately for playing the medieval engineers, this is a very cool game, and sometimes it would be something to create, related to mechanics, which you need to think about very well, again thank you for playing. Again we return to my English. I do not know, maybe there is some section on the forum for suggestions on the implementation of something in the game, but I do not know exactly where, I'll leave it here. I do not know if I can tell you what's in my head, but I'll try. I translated the Google translator. Excuse me. Is it possible to introduce such a mechanics as the wind. More: It is possible to connect windblades only for static blocks, but also for those who create players on wooden beams. This will create a bunch of huge mechanisms for wind traction: elevators, open / close gates, trolleys in the wind, well, after all, you can even do something like a car, trolleys with the same traction. Just everything that is being done now is an engine with an error with ropes and drums for them (((((This is a very diverse game, it will stand out from others and attract more players.I hope you understand me with your English (Thank you, that I love her very much and play with great pleasure. Pretty cool stuff in there guys. @MaxIlyich(RUS) wow, that didn't completely come through but, I think you're looking for a wind powered car or wind powered elevator? Have you tried hooking up the Mechanical block to a Rope Drum or the Mechanical block to Round Timber? Have you tried hooking up the Mechanical block to a Rope Drum or the Mechanical block to Round Timber? How do you do that by the way? In the main menu video it is shown, how crankshaft is connected to mechanical block, but I tried already multiple times on multiple blocks and I just can't connect anything (timber, round timber, round timber using catch block, crankshaft) to it. Only as static blocks. That main menu video has been around since the very beginning three years ago, it was some kind of trailer/concept video back then. You can't rely on that. Hey. Yes, I tried to connect almost everything but nothing came of it. Therefore, I would like to be able to connect the block of the blades to the hubs. Here's another video filmed with a bug on the engine. I'll try to roughly show how I see the concept of a car or Elevator on wind-driven. I also wish the output from a windmill could be attached to something other than just the sawmill, gristmill, and ore crusher. Player-built contraptions of all sorts!! Not today. It's a Czech national holiday today. This guy is so incredibly hilarious! What is this from? A bold new Clang for an old era! It's like the bugs from Space Engineers, except now Medieval Engineers are doing witchcraft in old times.